i want to turn on label using arcpy, i use current mxd and my mxd path in my script and my layers also active in the current MXD, but it give me this eror, can somebody help me? My suspicion is that the layer named point10 has been added to your current map (which you presumably opened using C:\Users\P51\Desktop\testingLABEL.mxd) after you created your MapDocument object named mxd. 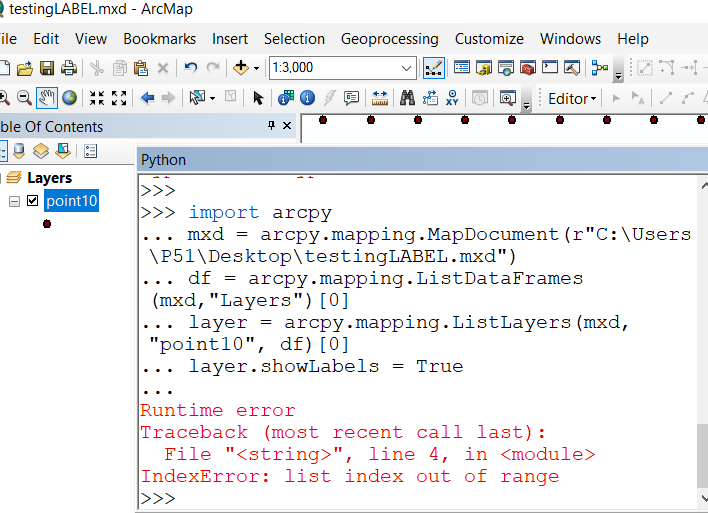 The IndexError seems to be saying that ArcPy cannot find a layer named point10 in the MapDocument object named mxd. As an aside there is never a need to import arcpy in the Python Window of ArcMap. That is done automatically when the Python Window is opened. Not the answer you're looking for? Browse other questions tagged arcpy arcmap labeling python-window indexerror or ask your own question.